Psychologists are under increasing pressure to demonstrate the ecological validity of their assessment procedures--to show that the recommendations concluding their evaluations are relevant to urgent concerns in the legal and social policy arenas, such as predicting dangerousness, awarding compensation, and choosing a custodial parent. How much damage does a referred patient have? Who or what "caused" the damage? What impact will it have on his or her future life, work, and family? And what can be done to remediate the damage? The purpose of this book is to provide sound objective methods for answering these questions. It integrates the knowledge of experienced practitioners who offer state-of-the-art summaries of the best current approaches to evaluating difficult cases with that of basic theorists who describe emerging methods in both predictive and inferential statistics, such as Bayesian networks, that have proven their value in other scientific fields. Arguably, the enterprise of psychological assessment is so interdependent with that of data analysis that attempts to make inferences without consideration of statistical implications is malpractice. 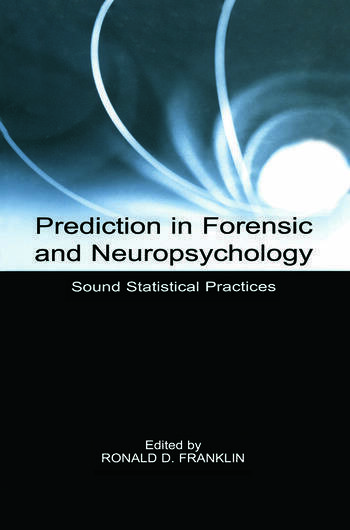 Prediction in Forensic and Neuropsychology: Sound Statistical Practices clarifies the process of hypothesis testing and helps to push the clinical interpretation of psychological data into the 21st century. It constitutes a vital resource for all the stakeholders in the assessment process--practitioners, researchers, attorneys, and policymakers. Contents: Preface. Introduction. C.A. Ruffalo, Advocacy in the Forensic Practice of Neuropsychology. R.D. Franklin, Neuropsychological Hypothesis Testing. R.D. Franklin, J. Krueger, Bayesian Inference and Belief Networks. R.D. Franklin, J. Krueger, Neuropsychological Evaluations as Statistical Evidence. G.J. Chelune, Assessing Reliable Neuropsychological Change. A. von Eye, C. Speil, M.J. Rovine, Configural Frequency Analysis in the Practice of Neuropsychology. M.L. Rohling, J. Langhinrichsen-Rohling, L.S. Miller, Actuarial Assessment of Malingering: Rohling's Interpretive Method. A. Kivioja, R.D. Franklin, Recovery of Function. S. Ke Jesus-Zayas, A.B. Fleming, The Prediction of Violent Behavior.